WHO: Denzil Porter, rapper from the Bronx, New York is hitting the stage alongside Ace Hood, BIG K.R.I.T., Asher Roth, Prynce Cy Hi, Cris Cab, Ray Jr., Wax and the legendary Nas at SXSW 2012. 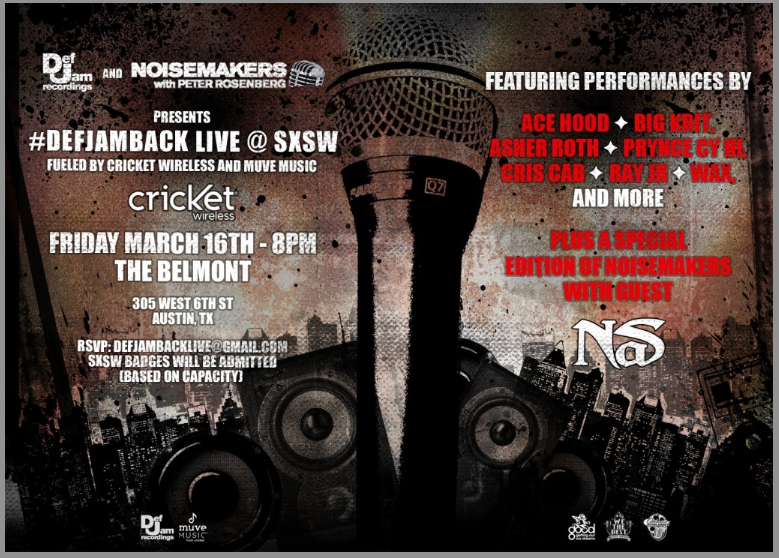 WHAT: Def Jam Recordings and NOISEMAKERS with Peter Rosenberg present #DEFJAMBACK LIVE, with performance by Denzil Porter. WHERE: The Belmont at 305 West 6th St. Austin, TX. WHEN: Friday, March 16, 2012 – 8:00 P.M. CONTACT: Please R.S.V.P. to DEFJAMBACKLIVE@GMAIL.COM. For media inquiries please contact Jeunesse Yvonne via phone or email at 917-596-6174 or JeunesseYvonne@gmail.com. For all other inquiries, please contact Denzil Porter’s manager, Mandell Conway at 347-835-1871 or MannyForbes@gmail.com. For more information on Denzil Porter please visit www.DenzilPorter.com.